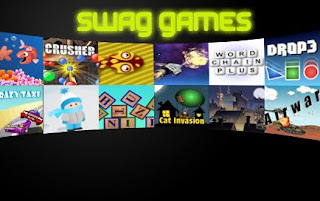 Swagbucks has a great promotion running this week for you: The Swag Nation Gaming Challenge! It's all happening over at Swagbucks Games. With Swagbucks Games portal, a fun collection of games that users can either play for free (and win small amounts of Swag Bucks at random) or enter tournaments for - where they spend a small amount of Swag Bucks to enter with the chance to win large amounts of Swag Bucks. The games vary in type from classic arcade type actions games to puzzles to word games to geography tests - there's something for everyone. Each day this week, they will be featuring a different game and running an all-day tournament where you can enter as many times as you want for only 1 Swag Buck an entry - the winner at the end of the day will get a minimum of 1000 Swag Bucks - the amount of Swag Bucks awarded increases as more and more people enter. In addition to that, each day they are going to randomly award 5 people who enter the special tournament with 50 Swag Bucks! Finally, The Swag Gal is posting a high score for another game and giving three people who beat her score and post a screenshot to Twitter with the hashtag #sbgames with 100 Swag Bucks each! People should go to the Swagbucks Blog each morning at 10 to find out what the new game is!